Take control of your own transformation with lightweight consulting support? We support agile growth and transformation across all levels and roles, with assessment, consulting and coaching. Our approach focuses on a holistic combination of training to create a catharsis for change, advisory / consulting services to set the direction and measurements, and coaching to make it work on the ground. Our model relies heavily on your internal staff so that you can grow your capabilities and minimize dependencies. Our goal is to help you increase your ROI, provide true value to your customers, and do so in a sustainable fashion. To achieve these objectives, your organization will move towards a leader-leader culture, where everyone, at all levels, is accountable for positive results and truly empowered to deliver those results. You will create a lightweight, streamlined, business architecture that mitigates risk, ensures compliance, and increases collaboration without creating burden. You will leverage the creativity of individuals, teams and groups. We support you, from enterprise to individual, and everything in between. Enterprise: Select products, projects and teams to focus on, then create an environment ripe for agile growth. Product: Support a team of teams as they roll-out a product by creating a release train (ART) and assisting with cross-team collaboration. Team: Process and engineering coaching to increase team's agile capabilities. Individual: Work with epic owners, program managers, product managers, Scrum Masters, developers, tester and other team members to help them execute their role within an agile process. We help you identify your future state, consult with you on how to get there, and coach at all levels. Assess: Identify where you are, and where you want to be. We do this in a lightweight fashion, starting with anonymous surveys to quickly and cost effectively get input from many people. We use this information to focus off-line and in person discussion and observation, so we can find out where you out without breaking our budget. Consult: Set the direction for growth by identifying the target state and how to move towards it. 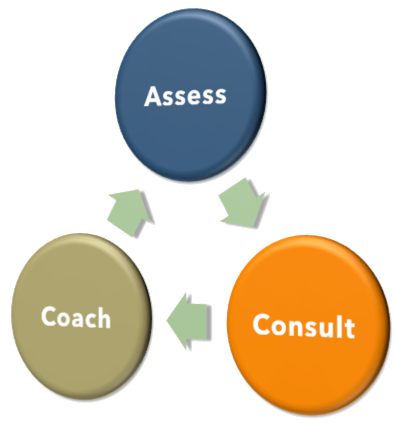 Process Coaching: Assist teams with process and engineering coaching to increase their agile capabilities. Engineering Coaching: Work with developers and testers to achieve technical excellence with acceptance test driven development, behavior driven development, test driven development, pairing, continuous integration, and other agile engineering practices.